step by step. I know I'm not the only person who feels like they start each day at the bottom of some long stairwell. Looking up at all of the steps that need to be climbed. Wondering how in the world I'm going to get there. And truth be told, life is good right now. It's just that each day is so busy with my to-do list that I forget to enjoy the little moments sometimes. Bottom of the steps. That's where I am at the moment. Maybe I'll make it to that landing by Christmas break. And to the top by January 1. Now that will feel good, won't it? Now that is for real!!!! Never thought about the day like that!! Hope u make it to the top my friend! You can send me your snail mail addy!! .............. one step at a time - right? I love the analogy! That will feel GREAT! Let't not talk about the next steps that will be waiting for us. Happy holidays, friend! i don't wish time away, ever....but i'm ready for 2013!! 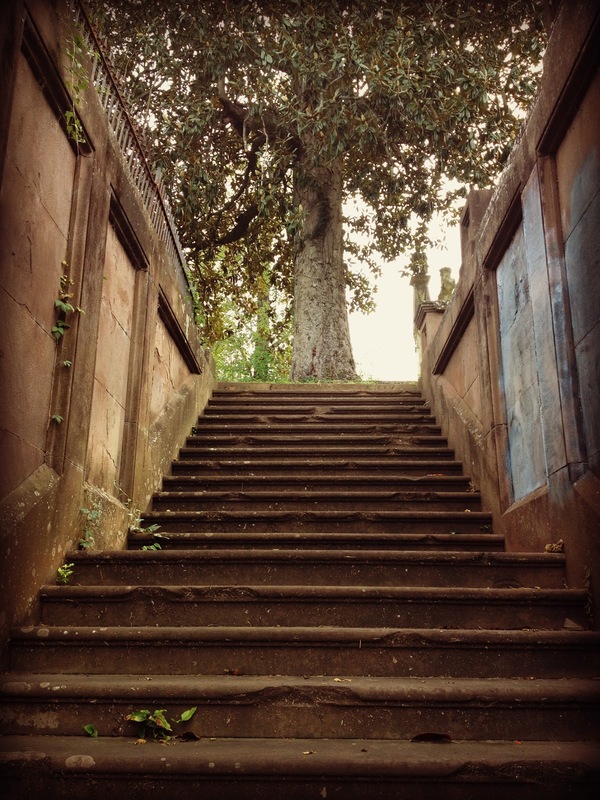 Beautiful photo Roban, with that tree at the top of the steps encouraging you to climb to the top and give it a big hug....I hug trees everywhere I go now...oh the energy I get from hugging a tree! I actually don't mind hanging around the bottom for a short time, you meet some really interesting people there and then slowly climbing collecting memories on the way can be a wonderful journey. I think so many feel this way at this time of year. Wonderful shot for your thoughts.